As mentioned in the introduction to this chapter, my cornerstone methodology will be action research, so I will give a quite lengthy description of this methodology, and relate it to IS and FLOSS. Then I will give a short definition of what a case study is, because case studies are my primary source of firsthand information. AR is social research carried out by a team encompassing a professional action researcher and members of an organisation or community seeking to improve their situation. AR promotes broad participation in the research process and supports action leading to a more just or satisfying situation for the stakeholders. Unlike conventional social science research that try to avoid any intervention in the research setting, AR demands intervention. AR do not primarily seeks to create general theories and to prove them true or false, AR shifts the focus away from general theories in favor of local relevance. AR is grounded in practical action aimed at solving real life problems while carefully informing theory. To inform theory AR involves a process of deliberate and systematic reflection, and generally require some sort of evidence to be presented to support conclusions. AR is inquiry that is done by or with the members of an organisation or community, never is research done to or on them (Herr and Anderson 2005). AR is, as previously mentioned, a multifaceted methodology which is practised in a number of different ways. According to Greenwood and Levin (1998) there are, however, three basic commitments that must be present for a process to be called AR; research, participation and action. I will use the reminder of this section to investigate this three commitments. A powerful motivating commitment in AR is to change an organisation or community into a more empowered, democratic and liberated state. The focus on change is characteristic of AR, actions are made to change the organisation and community in a way that the stakeholders have agreed on. AR focuses on action to create change in a social system, this is highly political so an AR practitioner have to deal with politics. Herr and Anderson (2005) frames the political considerations in AR within, among others, micro- and macro-politics. Micro-politics is the politicising that takes place in the local context of an organisation or community. Micro-politics includes the behind-the-scenes negotiations over material resources, vested interests, and ideological commitments. More often, micro-political struggles are over such things as professional jealousy, power differences in the organizational hierarchy, the allocation of space and other resources, gender and racial politics, and so forth. . . . [Micro-politics] is as much about what doesn’t get said as it is about what does. Problems in the local context are often related to broader social forces and problems. It is therefor important to identify macro-political factors influencing the context where the AR is conducted. The motivation to initiate AR research often comes from broader social and political issues. HISP was for instance initiated as part of a broader political agenda aimed at promoting equity after the end of the apartheid regime in South Africa. In AR the stakeholders in a research setting and the researcher will, usually, all be participating. How much stakeholders will participate will vary. In some AR research the stakeholders will be co-researchers, they will participate in the whole research cycle from identifying problems to reflectively identify learning. Many forms of AR, Participatory Action Research (PAR) among them, strongly emphasises this. It is important that the researcher and the stakeholders participate on level turf and develop a relationship based on mutual trust. By involving the stakeholders in identifying learning from an AR study, the creation of knowledge is made more democratic, and it is more likely that this learning would be used to inform new actions by stakeholders. As mentioned in connection with PD in section 2.2 effective participation can be a challenge to instigate, this challenges are relevant for participation in AR too. In many settings it is not feasible to form a close working team of researchers and the stakeholders. It might only be feasible to involve stakeholders in some of the phases of the research, like in action planning and action taking, but not in identifying learning. Neither is it necessary to form a formal team, participation by stakeholders can be achieved in less formal ways. Some level of participation do have to be present, however, even if it is limited to the researcher participating in the problem domain, be it an organisation or community. The relationship the researcher have with the organisation or community under study is something Herr and Anderson (2005) brings attention to. They use a scale they call the continuum of positionality. This scale goes from being an insider to the research setting to being an outsider. The degree of participation is highest at the middle of the scale. On the far left of the scale the researcher is an insider to the research setting, and the focus is on the research‘s own practice in relation with the research setting. Two other form of insider studies are when an insider collaborates with other insider and when insider(s) collaborates with outsider(s). In insider studies the research is initiated by insiders. At the middle of the continuum of positionality, where the degree of participation is highest, are the insider-outsider teams where the outsiders and insiders work together on level turf and have mutual trust. This is close to an ideal form of PAR, but it can take years to develop this kind of relationship, so it is generally not feasible within the constraint of a master thesis. More feasible is it for outsiders to collaborate with insiders, but where the researcher is clearly seen as an outsider. On the far right of the scale are the research where outsider(s) studies insiders. This is the form of AR that is closest to conventional social science research, but the researcher engage more closely with the study‘s participants. The insider-outsider positionality is one of many ways to think about positionality. Positionality occurs not only in terms of inside/outside, but also in terms of one‘s position in the organizational or social hierarchy, and one’s position of power vis-�-vis other stakeholders inside and outside the setting. AR is partly based on the belief that action and participation brings understanding. By introducing changes into a social process and observe the effect, knowledge about the local context can be deduced. AR do not rely on any specific methods for capturing data during the research. The researcher, perhaps in collaboration with the stakeholders, can choose whichever methods, qualitative or quantitative, found to be appropriate in the research setting. No matter which methods that eventually get chosen it is necessary to pay close attention to the quality of the data gathered, and be able to assure the correctness of interpretations made from the data. The researcher have to be able to demonstrate that the interpretations are more likely than alternative interpretations. In complex and changing social settings the degree of control needed to get reliable data by conventional research is often unattainable. Even if the problem domain is broken down into sub-problems that can be investigated under controlled condition, the researcher risk that the sub-problem will become irrelevant in the changing social setting. AR is often portrayed as a cyclical process like the one in Figure 3.2. AR attain rigor and flexibility by going through research cycles. The methods and research question can be refined in response to realities in the research setting. Most conventional research methods gain their rigour by control, standardisation, objectivity, and the use of numerical and statistical procedures. This sacrifices flexibility during a given experiment – if you change the procedure in mid-stream you don’t know what you are doing to the odds that your results occurred by chance. In action research, standardisation defeats the purpose. The virtue of action research is its responsiveness. It is what allows you to turn unpromising beginnings into effective endings. It is what allows you to improve both action and research outcomes through a process of iteration. As in many numerical procedures, repeated cycles allow you to converge on an appropriate conclusion. A common notion in the social sciences to attain quality in data and interpretations is through the notion of triangulation. Simply speaking this is about looking at a problem from multiple perspectives. By using multiple information sources and multiple methods the quality of data will most likely be better. It is also necessary for the researcher to address his or hers own biases and how this can affect the research. The researcher have to be self-reflexive. In Table 3.1 Herr and Anderson (2005) have proposed five validity criteria for AR and linked them to the goals of AR. What constitute evidence and validity in AR are still disputed, but they offer this criteria as tentative criteria. I will shortly describe this criteria here. refers to how the research is conducted. Important here is the cyclic and ongoing problematisation of the practices under study, the appropriateness of the methods used and the quality of the relationships built during the study. To have a good basis for the assertions made during the study, the notion of triangulation is important. The research data, methods and interpretations should be subject to peer review. The reviewer of the research can be stakeholders in the research setting, colleagues or friends familiar with the research setting, or fellow action researchers. It is important that the reviewer are critical in reviewing the research. is the extent to which action occur, which leads to a resolution of the problem that lead to the study. Action researchers have a double burden in that they have to focus on both action and research. The research must be of high quality as the same time as the action researcher have to move participants towards a successful action outcome. is the degree in which the researchers and stakeholders have moved towards a better understanding of the research setting, understanding which have the potential to transform the reality of the research setting. As with PD the concept of mutual learning is important, both the researchers and the stakeholders learn from each other and from reflecting on the problem domain. is the extent to which research is done in collaboration with all stakeholders in a research situation. If the study is not done collaboratively the researcher must take multiple perspectives and interests into account. Is AR used to improve the situation of some stakeholders at the expense of other stakeholders? The degree to which the research is relevant to the local context is also important to democratic validity. AR is rooted in the local context and focus on what is relevant locally. The question is then how lessons learned in a local setting can be apply to other settings. This is the question on how generalisable research findings in AR are. General theories have to apply in every local setting, so AR could be used to test general theories. This is not the motivation to use AR, since AR focuses on change and flexibility and not on challenging general theories. Greenwood and Levin (1998) change the question about whether research results from AR is generalisable to a question about transferability of AR research results. This places the responsibility of justification on the ones who seek to apply the research result. This looks somewhat similar to the notion of technology transfer in section 2.3.2. Perhaps we should talk about knowledge translation as well as technology translation? We argue that AR-developed knowledge can be valuable in other contexts other than those where it is developed, but we reject the notion that the transferability of knowledge from one location to another is achieved by abstract generalizations about that knowledge. Transferring knowledge from one context to another relies on understanding the contextual factors in the situation where the inquiry took place, judging the new context where the knowledge is supposed to be applied, and making a critical assessment of whether the two contexts have sufficient process in common to make it worthwhile to link them. Herr and Anderson (2005) finds Robert Stake‘s notion of naturalistic generalisation a compelling way to think about how AR is taken up by other practitioners and researchers. Figure 3.1 is a model of Stake‘s view of change. Change is based on action and action is taken either because of external demand or internal convictions. Coercive external demand is often successfully resisted by practitioners, most lasting change takes place through internal conviction. Conviction is again based on personal understanding and voluntarism. Voluntarism are personal feelings, values and faith. Formalistic generalisation are the propositional knowledge common in academia. Naturalistic generalisation are generalisations made from experience. This experiences are either direct or vicarious, that is “secondhand” experiences. Narratives are one way to convey vicarious experience. Toward the end of the 1990s AR began to grow in popularity in IS research circles. AR is rooted in action and research, and IS is an applied field which should focus on research relevant for ICT practitioners and users. This makes AR a good fit for research in IS. Baskerville (1999) list some specific forms of AR that they deem to be valid for research in IS. This list is given in Table 3.2 along with a reference to relevant literature explaining that form of AR. The references are given by Rose (2000). In addition to this list it should be mentioned that the Scandinavian approaches described in section 2.2 follow an AR approach. In the Scandinavian projects mentioned theory building was done based on the projects conducted. AR is indeed similar to organisational consulting and ICT consulting. Baskerville (1999) points out the need to distinguish between AR and consulting. AR is different from consulting in its commitment to research and the research community. A consultant is expected to get things done, and to suggest solutions based on experience. An AR researchers have to consciously collect data, analyse and reflect, and based on this the action researcher have to write papers founded within a theoretical framework. AR usually gives more focus to collaboration, while a consultant is usually hired to get a job done or to give an outsider‘s unbiased view of the organisation. (Baskerville 1999). 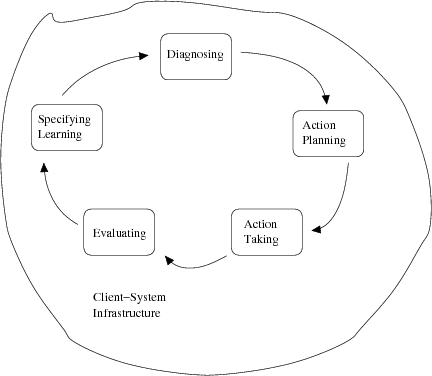 The client-system infrastructure in which the five phased cycle takes place, refers to the specifications and agreements that the AR research is governed by. This can be an agreement with a client organisation or the rules governing participation and action in more open ended settings, like a FLOSS project. As a basis for his essay The Cathedral and the Bazaar (Raymond 2001) Eric Raymond conducted action research. He did not give it that name, but that is what he non the less did. He was handed over the fetchmail (at the time called popclient) project. Previously he had been exposed to Linux development and decided to test the lesson he had learned from Linux in the fetchmail project. Based on the experience he made from managing this project and from cooperating with the contributors, he wrote his essay. I deem FLOSS projects to be fertile ground for conducting action research. Many, but not all, FLOSS project are very open to contributions. An action researcher can take on many roles in an FLOSS project. If the action researcher is a member of the project’s core he has the position of an insider, possibly collaborating with people more or less affiliated with the project. The action researcher can also be an outsider seeking to contribute to the project. Eric Raymond had the position of an insider cooperating with more or less outsiders. The core of the project was basically only Raymond himself. Doing AR in FLOSS is similar in many ways to doing AR in IS. AR in IS frequently happens within the confines of one or more organisations, while in FLOSS the participation and cooperation between stakeholders and researchers will most likely be more virtual. The client-system infrastructure will then consist more of rules for contributing and channels for cooperation, than it will consist of contracts and agreements. A case study, which is an in-dept exploration of one situation, is a common qualitative method used in the social sciences.
. . . the distinctive need for case studies arises out of the desire to understand complex social phenomena. In brief, the case study method allows investigators to retain holistic and meaningful characteristics of real-life events – such as individual life cycles, organizational and managerial processes, neighborhood change, international relations, and the maturing of industries. Case studies are often exploratory in nature and is a good fit for studies of little known problem domains. Case studies have been criticised for being a poor basis for generalisations, especially formalistic generalisations. Case studies are good for naturalistic generalisations, however. By basing assumptions on a number of case studies and by doing longitudinal case studies, stronger and stronger evidence for assumptions can be given. When the problem domain is better understood other kind of research methods like surveys and experiments can be useful.